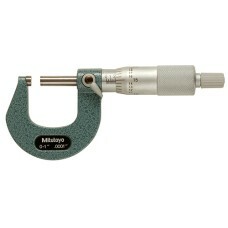 Mitutoyo Micrometers are on sale at Gaging.com! We are authorized Mitutoyo Dealers. 101-113 Mitutoyo Satin Chrome Mechanical Micrometer with Ratchet Thimble 0-1"
*product may vary The 101-113 Mitutoyo Satin Chrome Mechanical Micrometer with Ratchet Thimble 0-..
101-114 Mitutoyo Satin Chrome Mechanical Micrometer with Ratchet Thimble 1-2"
The 101-113 Mitutoyo Satin Chrome Mechanical Micrometer with Ratchet Thimble 0-1" is on sale at Gagi..
101-117 Mitutoyo Satin Chrome Mechanical Micrometer with Friction Thimble 0-1"
*product may vary The 101-117 Mitutoyo Satin Chrome Mechanical Micrometer with Friction Thimble 0..
101-118 Mitutoyo Satin Chrome Mechanical Micrometer with Friction Thimble 1-2"
*product may vary The 101-118 Mitutoyo Satin Chrome Mechanical Micrometer with Friction Thimble 1..
101-119 Mitutoyo Satin Chrome Mechanical Micrometer with Ratchet Thimble 2-3"
The 101-119 Mitutoyo Satin Chrome Mechanical Micrometer with Ratchet Thimble 2-3" is on sale at Gagi..
101-120 Mitutoyo Satin Chrome Mechanical Micrometer with Ratchet Thimble 3-4"
The 101-120 Mitutoyo Satin Chrome Mechanical Micrometer with Ratchet Thimble 3-4" is on sale at Gagi..
101-717 Mitutoyo Outside Micrometer with Ratchet Thimble 0-1"
The 101-717 Mitutoyo Outside Micrometer with Ratchet Thimble 0-1" is on sale at Gaging.com! We ar..
102-717 Mitutoyo Outside Micrometer with Ratchet Thimble 0-1"
The 102-717 Mitutoyo Outside Micrometer with Ratchet Thimble 0-1" is on sale at Gaging.com! We ar..
102-718 Mitutoyo Outside Micrometer with Ratchet Thimble 1-2"
The 102-718 Mitutoyo Outside Micrometer with Ratchet Thimble 1-2" is on sale at Gaging.com! 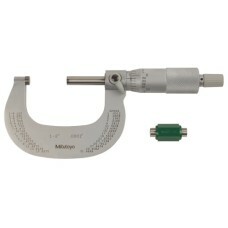 We ar..
103-131 Mitutoyo Outside Micrometer with Ratchet Stop 0-1"
The 103-131 Mitutoyo Outside Micrometer with Ratchet Stop 0-1" is on sale at Gaging.com! We are a..
103-132 Mitutoyo Outside Micrometer with Ratchet Stop 1-2"
The 103-132 Mitutoyo Outside Micrometer with Ratchet Stop 1-2" is on sale at Gaging.com! We are a..
103-217 Mitutoyo Outside Micrometer with Ratchet Stop 2-3"
The 103-217 Mitutoyo Outside Micrometer with Ratchet Stop 2-3" is on sale at Gaging.com! We are a..
103-218 Mitutoyo Outside Micrometer with Ratchet Stop 3-4"
The 103-218 Mitutoyo Outside Micrometer with Ratchet Stop 3-4" is on sale at Gaging.com! 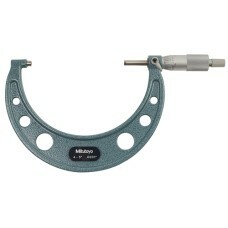 We are a..
103-219 Mitutoyo Outside Micrometer with Ratchet Stop 4-5"
The 103-219 Mitutoyo Outside Micrometer with Ratchet Stop 4-5" is on sale at Gaging.com! We are a..
103-220 Mitutoyo Outside Micrometer with Ratchet Stop 5-6"
The 103-220 Mitutoyo Outside Micrometer with Ratchet Stop 5-6" is on sale at Gaging.com! 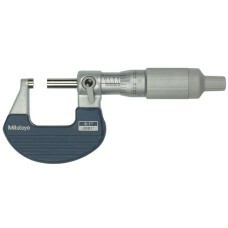 We are a..
103-221 Mitutoyo Outside Micrometer with Ratchet Stop 6-7"
The 103-221 Mitutoyo Outside Micrometer with Ratchet Stop 6-7" is on sale at Gaging.com! We are a..